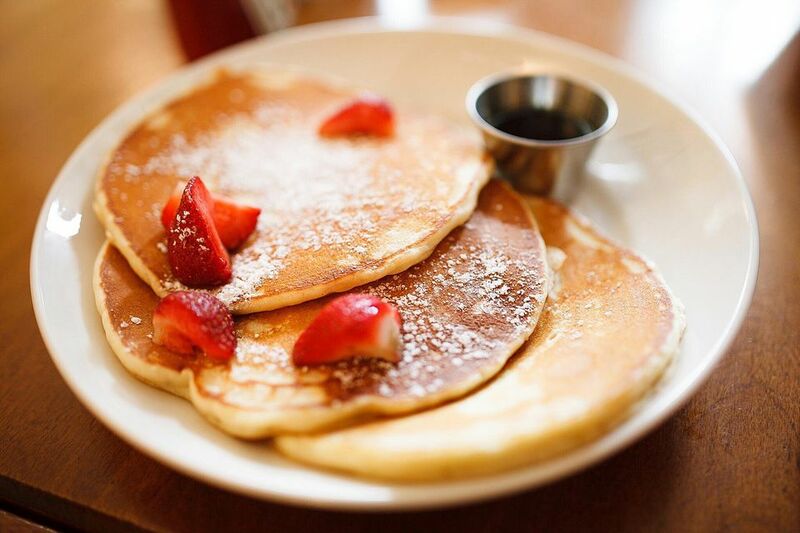 Classic Pancakes are just that: classic. This is just the perfect recipe for the best pancakes. Read through Pancake Tips before you start for best results. The most important tip I can give you is to measure flour accurately. Too much flour will make heavy, dense pancakes. Always spoon the flour into the measuring cup and level it off with the back of a knife. Never scoop the measuring cup into the flour; you can get up to 25% more flour that way. Serve these pancakes with maple syrup and butter. I, however, prefer to eat my pancakes with powdered sugar and fruit. Stir with a wire whisk until combined. In small bowl, combine milk, cream, eggs, and melted butter and beat until smooth. Add to the flour mixture and stir just until combined. Cover batter and let stand for 10 minutes. While the batter is standing, heat a griddle to 350 degrees F.
Lightly rub the griddle with a tablespoon of butter. When a drop of water sizzles when dropped onto the griddle, use a 1/4 cup measure to pour four circles of batter onto the griddle. Cook until the edges look dry and bubbles form a just begin to burst, about 2-4 minutes. Turn the pancakes and cook for 1-2 minutes on second side just until golden. The second side of the pancake will never get as brown as the first - that's okay. Did You Know You Could Make Scrumptious, Fluffy Dairy-Free Pancackes?